NOTE: While I've already shared in my 12.12.16 posting one phenomenal experience from my sojourn in Egypt, I've saved this particular story for October in honor of Breast Cancer / Breast Can Cure Awareness Month (also see my 10.01.14 entry). Soon after my marriage collapsed in 1998, I reserved a spot with a tour group set to explore the Egyptian Giza Plateau. The trip was scheduled for January 1999—still nearly a year off—but enough time I hoped to gather together my tattered self-confidence and celebrate my newfound independence in the Land of the Pharaohs. My excited anticipation of that celebration was abruptly interrupted when, in late summer 1998, cancer was discovered deep in my breast and a lumpectomy was quickly scheduled. While the double-blow of divorce and cancer was devastating, the surgery was nevertheless a success and, despite the ongoing emotional trauma, my body began healing physically on schedule. That is, except for the three-inch wound on my breast which seemed to have ideas of its own. Although expertly stitched together, the tissue on either side of the incision refused to grow together. The upper layer of my epidermis remained open, while the deeper tissues slowly built up to fill in the gap, creating what I feared would be a grotesque scar. I was wrong. Over a four-month period, I watched in amazement as the scar tissue and stitch marks coalesced into the unmistakable image of a large, elongated eye complete with iris, pupil, and exaggerated upper and lower lashes. By the time I packed my bags for Egypt, the scar—when viewed in the right light and shadow—revealed the familiar Egyptian Eye of Horus surrounded by the rays of the All-Seeing Eye (as seen atop the pyramid on the dollar bill). Horus was the falcon god of war and hunting and, according to mythology, could represent everything from majesty, battle, and power to protection and restoration. My emotions already a mess, and dead tired after weeks of radiation, I boarded the flight for Cairo wondering whether his symbol branded on my breast meant I'd been blessed or cursed. On arrival in Egypt, our tour group of 250+ was asked to break into smaller groups of 20 by signing up with tour guides stationed at many tables set around a large conference room. Each group was named after a different Egyptian god, and the tables with signs sporting the names of the most popular gods—Ra, Osiris, Hathor—were immediately swamped. I pushed my way through the crowd looking for a table with a shorter line. Over the sounds of chaos, I suddenly heard my name called and, after some confusion, realized the voice was coming from a room adjacent to the conference hall. I ran around the corner to discover a small room with a sole sign-up table nearly empty of people. I quickly added my name to the sign-up sheet, then looked around to see who had called my name. I didn't recognize a soul. Then I looked up to see which tour group I had joined. The sign read: Horus. By fate or simple serendipity, I was now part of the group named after the god whose symbol rested high on my breast. Disturbed by this strange Horas connection—and suffering from severe jetlag and post-radiation exhaustion—I barely slept that night. The morning brought further anxiety when it was announced we'd be taking a long walk around the Giza Plateau that day. Doubting I could keep pace with the group, I nevertheless headed up the steep road that led from our hotel to the looming pyramids. Along the way, our tour guide Jamila recounted the many mythological tales of the god Horus and, though I tried my best to keep up, I fell further and further behind my fellow travelers. Straggling behind the group and trying to catch my breath, I was overcome with the sudden fear that this was now my new and forever reality. I was in one of the most spectacular places on earth, yet I was so physically and emotionally drained I could not enjoy the experience. I wondered why I had even bothered to come. Finally, once atop the plateau, we took a much-needed break. By happenstance, Jamila ended up standing next to me. As others wondered off to explore the area, I seized the opportunity to ask the one question that was now burning in my throat: "Jamila, does it mean anything if you have a scar shaped like the Eye of Horus on your chest?" "You have one on your body?" she asked. In answer, I pulled open my blouse to reveal the scar easily visible a hand-width below my neckline. Jamila's eyes grew wide and she clasped her hands to her heart. "That," she said staring at the scar, her voice dropping to a reverent whisper, "is a sign of healing." She looked up to meet my eyes. "How did this happen?" I told her about my breast cancer. "This is a powerful symbol," she continued, shaking her head in amazement. "I have never seen such a thing." Jamila reached out and lightly touched my shoulder. "You are protected. You are blessed." The hair rose on the back of my neck, and I began to tremble. I took Jamila's hands in mine and thanked her for her kind and generous words. As I did, I felt a surge of renewed energy and spirit. Something had shifted. The air felt richer and the sky appeared brighter. Each step I took thereafter felt lighter and filled with purpose. I completed my Egyptian tour with energy to spare and an overwhelming sense of gratitude. Had the Eye of Horus symbol really brought healing like some magical amulet? Or had the comforting words of Jamila simply soothed a broken spirit? I suspect the answer lies somewhere in between. As Charlotte and I touch on in "The Dream Crystals of Gandara," all sound and all shapes emit and reflect unique energies in the form of waves and vibrations. Recent science, along with longstanding lore, indicate humankind responds both physically and spiritually to these energies, and the results can be uplifting or deleterious. There on the Giza Plateau, I found myself bathed in the positive energies of Jamila's encouraging words, the potent Eye of Horus symbol, and the majesty of the Egyptian pyramids—the perfect baptism for a powerful healing. Thoughts, musings, and words of wisdom from our distinctly different minds and POVs. Disclaimer: The views and opinions expressed in one author's blog do not necessarily reflect the views and opinions of the other author! To respond to blog postings or post comments about the book, please go to our Facebook page. 12/19/14 Caverns, crystals . . . and "Oh Little Town of Bethlehem"
10/01/14 Should Breast Cancer Awareness Month Be Breast Can Cure Awareness Month? 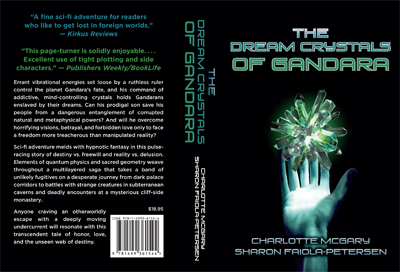 09/27/14 Kirkus Review of "The Dream Crystals of Gandara"
08/30/14 The Long-Lost Intro to "The Dream Crystals of Gandara"
Sharna Moon Books is the official website for the science fantasy novel "The Dream Crystals of Gandara" and other writings by coauthors Sharon Faiola-Petersen and Charlotte McGary.